Conveniently located in Gulf Gate, we are the exclusive BERNINA sewing machine dealer in the Sarasota area. With a Certified BERNINA technician on staff, a full bastion of shiny new machines (sewing, embroidery, longarm and sergers) and vibrant classroom - we are here to satisfy all of your sewing needs. 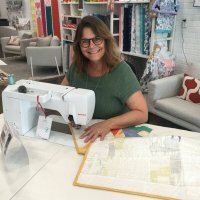 The Modern Sewist is also a boutique fabric shop with a unique selection of modern and contemporary fabrics, patterns, gifts and helpful tools. We stock the largest selection of Tula Pink, Cotton+Steel, Carolyn Friedlander, Alison Glass, Elizabeth Hartman, and Moda Grunge in the area, along with many other of your favorite designers. We also stock linen/cotton blends and canvas for all of your bag-making and home decor projects as well as garment substrates such as rayon, lawn and double gauze. Classes and special events are scheduled regularly. We are all about community and building relationships. Get in here, grab a cup of coffee or tea and share your sewing projects with us! A useful and sturdy tote with plenty of great organized storage. You'll be ready to go wherever life calls. Mix and match your favorite prints! Exterior zippered pocket and flap pocket. Knitting needle slip pocket and yarn guides.